The U.S. Federal debt bomb continues to increase, even with the government shut down. In just one day, the U.S. public debt increased $50 billion on Jan 15th. While the total outstanding Federal debt has now reached nearly $22 trillion, it doesn’t include all U.S. government debt. That’s correct… there’s a lot more debt than Americans realize sitting on the balance sheet of the U.S. Government. For example, there are other obligations such as U.S Government Agency Debt that isn’t well-known. According to the USGovernmentSpending.com website, U.S. Agency debt is the amount of outstanding debt issued by federal agencies (such as FHLB and GNMA) and government-sponsored enterprises (such as Fannie Mae and Freddie Mac). 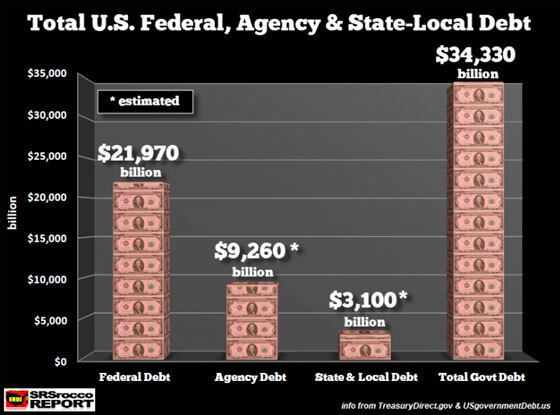 Then we have also to include State and Local Debt that is not apart of the U.S. Federal public debt. California holds the highest amount of State Debt in the country at $155 billion followed by New York at $141 billion. You can check out the debt of each state here: Compare State Debt. Thus, total outstanding U.S. Government debt is a staggering $34.3 trillion. So, there is an additional $12.4 trillion of debt on the U.S. Government balance sheet, which turns out to be more than half of U.S. Federal Debt. A trillion here and a trillion there really starts to add up. So, if we include all of this debt and compare it to the U.S. GDP, it is substantially higher than the current 104% stated by the Federal Reserve. By incorporating ALL debt, the total U.S. Government debt to GDP figure is more like 166%. 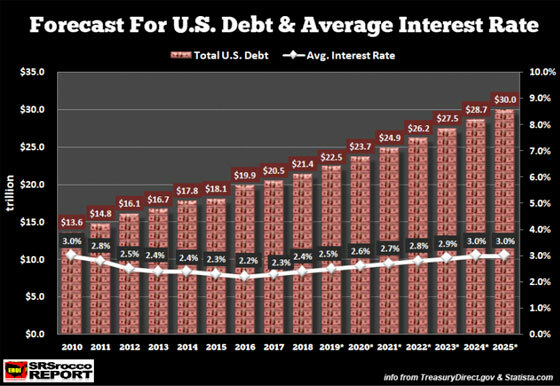 Of course, the accountants at the U.S. Treasury and Federal Reserve don’t want to include all of this debt because it makes the financial ratios much worse. According to Statista.com, total U.S. Federal Debt will reach $22.5 trillion by the end of fiscal 2019 (Sept 30th) but will continue to increase to $30 trillion by 2025. I have also included my estimated average interest expense paid by the U.S. Treasury for its outstanding public debt. Remember, this only consists of the current $21.97 trillion of Federal Debt. The data put out by the TreasuryDirect.gov website has shown that the interest expense the U.S. Treasury has paid for the first three months of fiscal 2019 (Oct-Dec) was $164 billion, a hefty 12% more than the $147 billion paid during the same period last year. 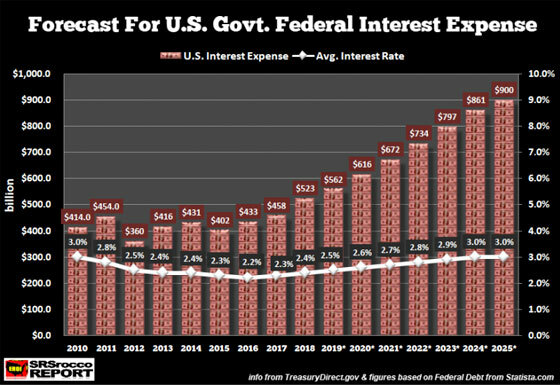 If we estimate that the U.S. interest expense in 2019 is going to increase by 12% for the entire year, that turns out to be $580 billion… very close to the estimated $562 billion shown in the chart above. Now, some individuals might not agree with my estimated 3% average interest rate by 2025, but we must remember that the low 2.2% rate in for 2016 took place when the Fed Funds Rate was 0.25%. So, when the Fed lowered its interest rate down to nearly zero, the lowest the average interest rate paid for U.S. Treasury Debt was 2.2%. Hell, my 3% interest rate by 2025 might be too conservative. Either way, the U.S. Debt Bomb is much higher than most Americans realize. When the U.S. economy finally starts to implode investors need to understand that ASSET values will evaporate while DEBTS stay the same. That is a recipe for disaster. As I have mentioned in several of my articles and videos, Gold and Silver are not backed by debt, which is why they will be some of the best safe havens when the value of most assets disintegrate.